I have made six other windows for the church. Some are shown on the gallery page. The window is much about the good things bestowed on us by God. In the left lancet we have natural things, the growing wheat which mankind can harvest and transform into nourishing food; water which sustains all life is bountifully flowing as a cascading river and yet is also being poured as a gift from an Amphora. The sacraments of Baptism and the Holy Eucharist come to mind particularly in the right hand lancet where bread is seen at the base and just above a chalice with the Host. Looking higher we see a Cross surrounded by a crown of thorns, the flow of red glass through the lancet hints at the suffering of the Passion of Christ and his sacrifice for all Mankind. St Margaret's is a very beautiful building and parts af the tower end date back to Saxon times. It has a double arch leading up into the Chancel. 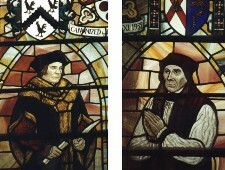 Edward Burn Jones lived in the village towards the end of his life and the church hosts about seven of his windows, most notably the main East Window showing St George. Another window is of St Margaret, a gift from the artist on the occasion of his daughters marriage in the church; the face of the figure being a portrait of his daughter. 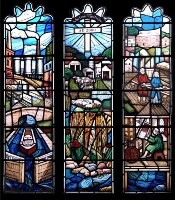 There is a fine Jesse window and a depiction of Jacob's Dream. The aim of the brief was to depict something of the history and life at Seend, in terms of Its past and present, including the importance of its agricultural setting and way of life. The right hand light shows the woollen and weaving industry which played a part in the early growth and development of the village. Many of the big houses were built on the wealth of the weaving trade. The lancet shows the weavers cottages, with images of working at burling (cloth shearing) and weaving shown below. The left hand light shows the other industrial side of Seend. Iron ore mining and the blast furnaces for the smelting process which took place adjacent the village for a period. Remarkably the three fifty foot towers of the blast furnaces and other industrial type buildings are now completely gone, leaving hardly any trace of their existance. The canal was built primarily to transport raw materials too and from the area. Now it canal exists mainly as a leisure facility and yet is a reminder of these former times of which perhaps few people are aware. The central lancet celebrates the rural and agricultural way of life. Corn grows at the waters edge and above the corn, sheep are resting and cattle graze higher up. Behind them the farm environment can be seen. A cross is placed in the sky and above are the words ôIn the Cross of Christ I Gloryö. Finally æA.D. 2000Æ is placed at the base, blending into the blue colours of the water. Water flows throught the base of the window, linking the three lights. This could suggest the idea of the æRiver of LifeÆ and the continuity of GodÆs gifts through the passsage of time. 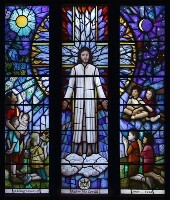 Christ is shown in the centre and children are looking up at Him from the side lancets. Christ is standing on a cloud with arms and hands open before him in an attitude of æoffering and receptivityÆ. He is placed against the background of a cross within a large circle, a form of Mandala - His head at the centre of the circle and cross. All this is predominently set in blue glass, but in contrast, the edges of the center lancet and circle are ringed with flames . I wanted this to convey a feeling of great radiating energy. Outside of the circle is the sky showing the Sun (LH) and the Moon (RH), indicative of the fact that Christ is there, omnipresent and watching over the children at all times of the day or night. (The children reflect the ethnic diversity of the people in the area at least two are obviously foreign i.e. Indian and Chinese.) The ground the children are sitting on is in pale blue flashed glass with paint and stain to give an indication of grass, some flowers. The mid background area in the LH side has similar paint and staining to indicate some leaves and produce a feeling of things growing. This window shows The stoning of St Stephen outside the walls of Jerusalem at St Stephen's or Damascus Gate. As a crowd are preparing to stone him, St Stephen is looking upwards and he has a vision of God and the glory of Heaven. Saul, a soldier later to be known as (St) Paul the Evangelist, is seen in the background holding the garments of the stoners. The window is situated in the South Trancept Chapel which is dedicated to St Stephen. Christchurch Priory is a magnificent Norman building, at Christchurch near Bournemouth. Following a request for a design for a window on the theme of WORD & SACRAMENT the beginning of St JohnÆs Gospel was used as a starting point. The Left lancet - John 1:1 ôIn the beginning was the Word, and the Word was Godö. In the right lancet - John 1:14ôThe Word was made flesh, and dwelt among us.Looking at æSacramentÆ, a Chalice and Host is shown on the right hand side and to balance this with reference to The Word a Bible is set in the left side, here colours are darker, as in the Beginning of things but more light is allowed through the RH lancet, to indicate we may become more enlightened in the passsing of time. Some subtle shading marks are also introduced in the background some of the blue glass to suggest The Flowing Waters of Baptism.The Lightning comes from above and pierces the dark colours, travelling towards the Word of the Bible. I have carried this lightning into the next panel where the shaft of light comes to rest on the word Us. The imagery has been created mostly on the new streaky glass made by the recently set up English Antique Glass Co. situated near Redditch. The techniques of fired paint and silver stain, combined with some acid etching, were used to create the letters to bring out an ambiguous effect where the words may not be immediately too obvious but will become clearer as one contemplates the window. The general background of colour to the lettering will contain a horizontal flowing swing of lines which link this design to existing green altar cloths which were being used when I visited the church. [Acts 2:2] And suddenly there came a sound from heaven as of a rushing mighty wind, and it filled all the house where they were sitting. [ 2:3] And there appeared unto them cloven tongues like as of fire, and it sat upon each of them. [2:4] And they were all filled with the Holy Ghost, and began to speak with other tongues, as the Spirit gave them utterance. [Mat 3:11]"I baptise you with water for repentance. But after me will come one who is more powerful than I, whose sandals I am not fit to carry. He will baptise you with the Holy Spirit and with Fire. The inscription reads: ôHe will baptise you with the Holy Spirit and with fire.ö [Matt 3:11]. The subject chosen for the window is the parable of 'The Seed and the SowerÆ. The idea was to have the centre light showing the 'Seeds that brought forth an hundred fold' - the other two lights showing the seed which has choked amongst weeds, brambles(LH) and the seed which has fallen by the wayside and dried out on stony ground(RH). Looking at the imagery - above we see a grand Oak tree flanked by an Elm , now more or less extinct in Britain, and a Yew commonly seen in churchyards and a symbol of longevity. From a personal viewpoint, much of my inspiration is gained from the natural landscape which reveals the Creative forces of life, reflected in nature. This window is a gift from the people village, an expression of thanks to the Creator, for the rich and beautiful land and life they are able to enjoy and which sustains them physically and spiritually. Using the central columns of the two lancets as a focal point of the trunk, the Tree of Life', with leaves modeled on the Beech tree, is a dominant feature of the window. in the background on the skyline are the GRIMSTEAD BEECHES woods and the PEPPERBOX FOLLY, also a familiar feature on the hillside. Below are the slopes of the Downs that rise above the village, showing the fields ambiguously, as though seen at different seasons of the year. Much is left to the play of ones imagination. There are ploughed fields in the distance and livestock is seen grazing in the fields.